Classic design and eco-friendly comfort make for a relaxing stay at the Best Western Jardin De Cluny. The hotel's high service and environmental quality standards have earned it the European Eco-Label certification. Located on a quiet street within the lively Latin Quarter, the hotel puts you within easy reach of Notre-Dame cathedral, and other Paris landmarks. 39 well-appointed guest rooms offer the conveniences of home such including free Wi-Fi, tea and coffee welcome trays and mini-bars. The hotel library, lounge and bar provide offer a welcoming retreat. The multilingual staff is available round the clock, and a concierge is at your service. 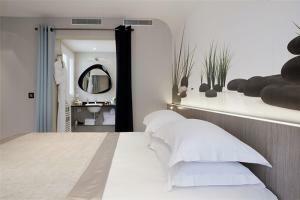 Located in the Latin Quarter, in Paris' 5th arrondissement. 21 miles from the Charles de Gaulle Airport and 9 miles from Orly Airport. The nearest Metro stop is Maubert - Mutualite, approximately 200 meters away.